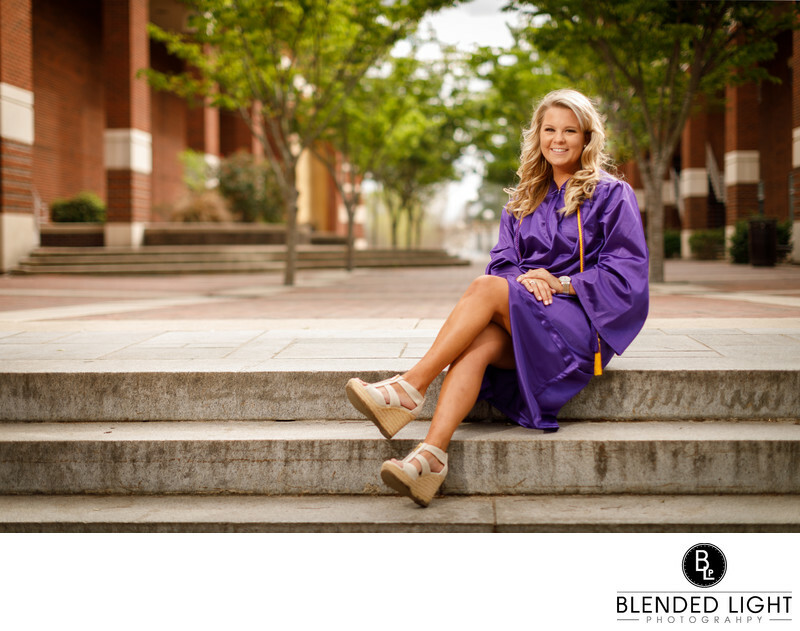 The steps leading up to Joyner Library on ECU's main campus is another special location for Pirate seniors. The top steps are split into segments by large columns that play bell tones whenever someone walks in-between them. These tones carry across campus and provide a beautiful backdrop of sounds for the campus to enjoy. In addition to the steps being a wonderful spot for pictures, the background is also excellent for for really bring out the individual because it provides some color without being overwhelming. The one issue that arises with late afternoon sessions here at the library is that the sun is generally shining straight down the background walkway or hidden behind the library itself. When this happens, I have a deep shadow covering the student, and that won't work. Using simple posing and off camera flash, I'm able to create natural looking images without loosing the backgrounds. This image has my studio flash just out of the frame on the camera's left shot into a 43" octabox that wraps light around my graduate, throwing a soft and pleasing light across and around her. It's such a joy to be able to return and watch fellow Pirate graduates share the joy and excitement of those last few weeks on campus, especially if they beam with excitement like this one! Location: West 5th Street, Greenville, NC 27834. 1/800; f/1.8; ISO 50; 50.0 mm.